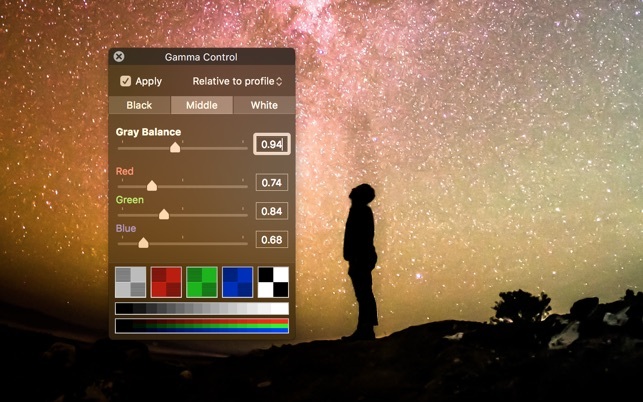 Gamma Control is used by designers, photographers, and filmmakers to improve color reliability or adjust screens so they fit within various lighting conditions in pictures or videos. It can also be used when playing games or viewing videos to reveal details normally too subtle to be seen. The middle point adjusts the tint for grays and can lighten or darken intermediate colors. 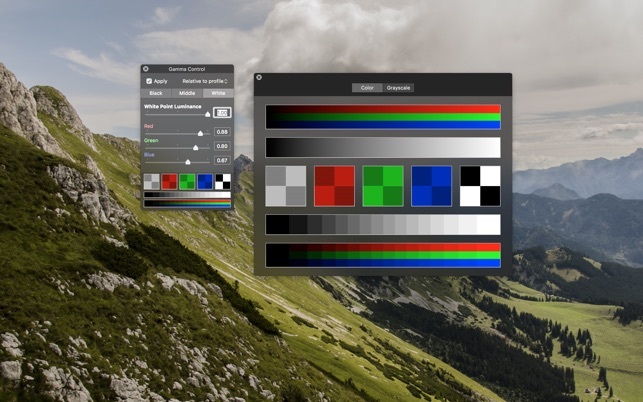 The setting applies to the whole screen in real-time so you don’t need to take a screenshot and open an image editor. Just start your video or play your game and enjoy the lack of darkness. Many LCD panels today adjust the brightness of their backlight using PWM (pulse width modulation), switching it on and off quickly like a strobe. Generally invisible to the naked eye, this will often result in horizontal or vertical lines when captured on camera. To avoid this, maintain the screen at its maximum brightness and instead reduce the luminance of the white point using Gamma Control. 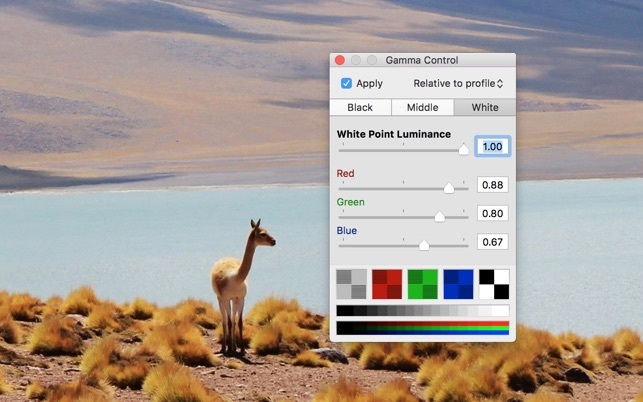 Gamma Control lets you balance the screen’s colors with the ambiant light. 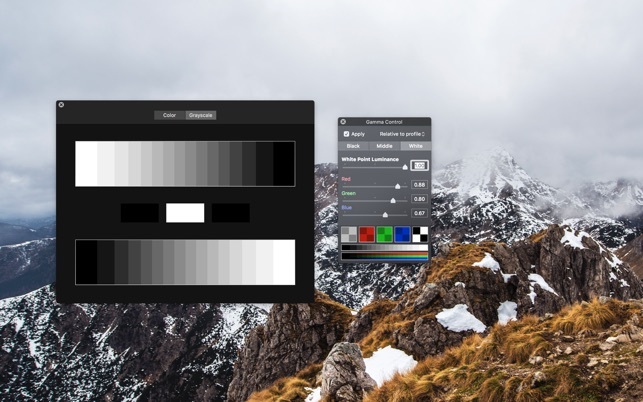 If the screen looks too blueish or is otherwise clashing with its surroundings, adjust the white point to better match the the environnement and lighting. If you are filming with a camera and the mid-range colors appear too bright (washed out) or too dark, adjust the middle point until the camera sees things the way you want. Gamma Control has calibration patterns integrated in its control window. 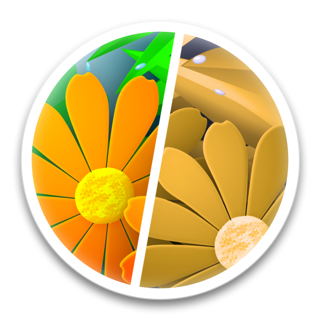 Click on them to enlarge in a separate resizable window you can look at from a few feet away. Use Gamma Board to you can change the settings remotely from an iPhone or iPad on the same network. Check Allow remote configuration in the preferences and this Mac is ready for Gamma Board. 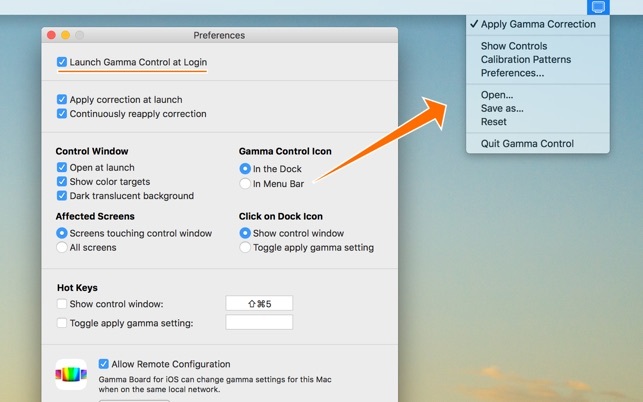 Important: remote configuration can only be active for one Mac at a time on the local network with the Mac App Store version of Gamma Control. • Toggle between dark mode and light mode following your preferences. 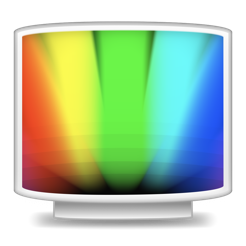 • Move the Gamma Control icon to the menu bar to save space in the dock. • Calibrate each screen by moving the control window from one to another. 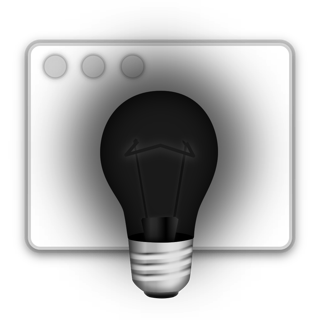 • Make the control window appear under your mouse pointer at anytime with a key combo. • Hold Shift while dragging the red, green, or blue slider to move all three simultaneously. 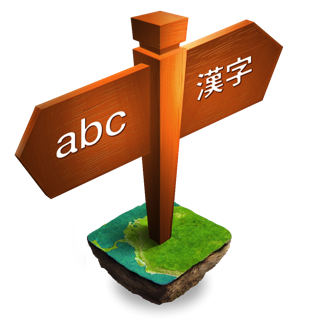 • Use a global keyboard shortcut to activate and deactivate the settings. • Use arrow keys to increase or decrease values in text fields. 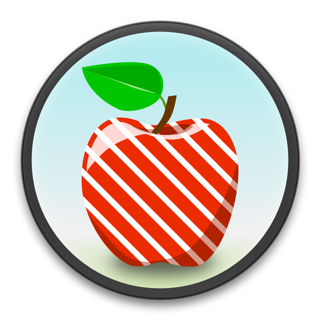 • Save your settings to transfer them to another Mac. • Touch Bar support for the newest MacBook Pros. Dark mode requires OS X 10.10 Yosemite or later. Remote configuration requires Gamma Board, sold separately. • Reseting gamma curve more proactively on quit, instead of counting on macOS to do it for us. This does not change the behavior of the app but resolves a somewhat nebulous issue with video capture and/or playback with certain applications on particular hardware configurations.